The Blue Ridge Mountains of western North Carolina are breathtaking to behold. Tree-covered mountain summits are shrouded in mist, while deep-cut river valleys and gorges slice through the landscape, spilling and tumbling crystal-clear mountain waters over towering rock formations to create that most magical of nature’s creations–waterfalls. And there is something especially magical about waterfalls. When a river meets towering rock, something happens as it drops and spills into a pool below. Perhaps it is a quickening of the elements that stirs the soul when beholding tumbling torrents diving over majestic granite cliffs and releasing energy that is resolved as a fine mist. Waterfalls are simply beautiful. They’re strikingly photo-worthy. And the Blue Ridge Mountains are home to scores of them, just waiting for your discovery on your next Bluegreen Vacations resort stay at the nearby Club Lodges at Trillium in Cashiers. In fact, many are located along U.S. Highway 64, the longest numbered route in North Carolina that stretches from the Tennessee state line to the Outer Banks. 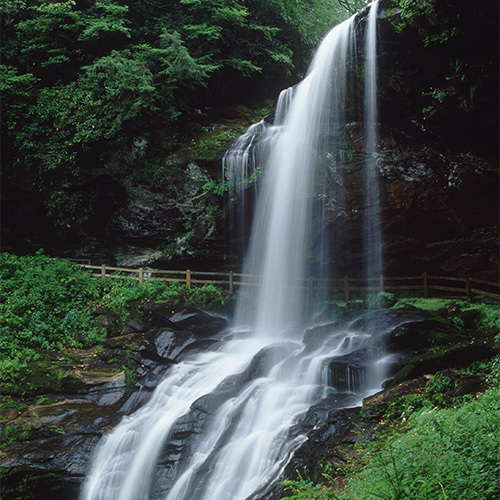 As it winds its way through the Blue Ridge Mountains, it takes on the additional name of the Mountain Waters Scenic Byway, and for good reason as it takes travelers past over 60 waterfalls just off the road. Here are six area favorites for your consideration that are also easily accessible. Located just 4 miles south of Cashiers in the Nantahala National Forest, this charming 25-foot waterfall spills into an inviting and serene pool surrounded by forest and featuring a small beach area. Roadside parking leads to a quarter-mile walk on a mostly-level trail. It’s perfect for small children and adults looking for a cool, tranquil mountain respite on a hot summer day. 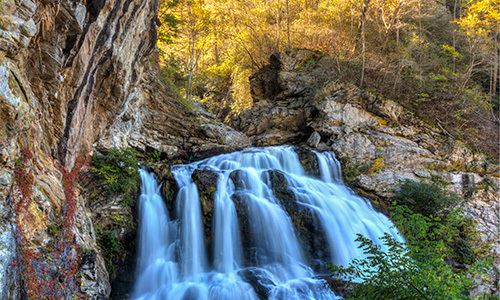 Derived from a Cherokee word meaning “honey locust place,” this 250-foot waterfall is ideal for photo ops any time of year. It’s an easy pull-off from the road, where there are spaces for 4-5 cars at a time. There aren’t any signs for this waterfall, so you need to drive slowly and look for the pull-off, where you can appreciate the beauty of the falls from. A small, unofficial trail leads down the hill from the parking spot, but don’t attempt it unless you are an experienced hiker! With a much higher water volume, this 75-foot high waterfall just a mile from Bridal Veil Falls features dramatic cascading whitewater tumbling into the gorge below. Located roadside, Dry Falls has a fully-accessible trail that allows visitors to go behind the falls and still stay dry—hence the name. On sunny days, you may be able to see a rainbow as the mist forms a prism. Talk about magical! 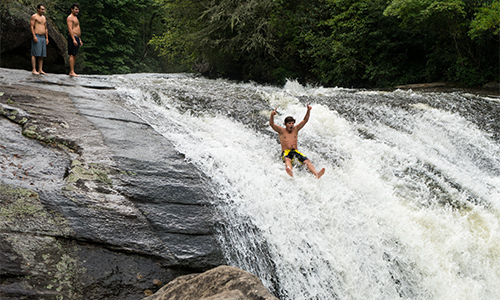 Bring your bathing suit for this one, because these falls form a natural water slide that takes stronger swimmers over a thrilling 20-foot drop of smooth, curved rock and plunges them into a deep pool below! Also known as Umbrella Falls, it is a 3.5-mile round-trip hike from the Gorges State Park entrance, so bring comfortable hiking shoes, too. 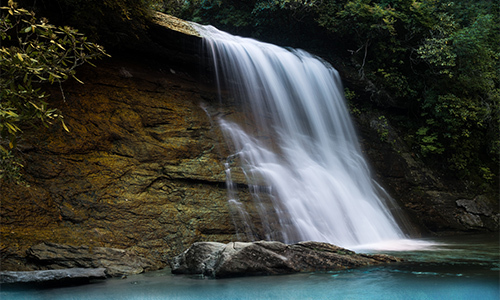 Looking for a more serene swimming hole? Try Hidden Falls, about a third of a mile downriver. Also known as Cullowhee Falls, this cataract is located just below the dam for Lake Glenville on the West Fork of the Tuckasegee River. 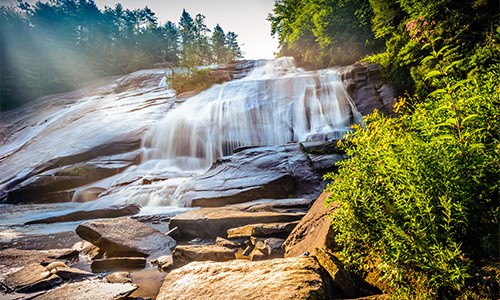 If you happen to visit when extra water is being released from the dam for kayakers (on select days in June, July and August), you’ll witness the most powerful waterfall in the Carolina mountains, a dynamic display of roaring waters washing down over 150 feet of rocky drops. The rest of the year, the falls are more tranquil and equally as pleasing to view from a rocky outpost of your choosing, or even to dip your feet in. 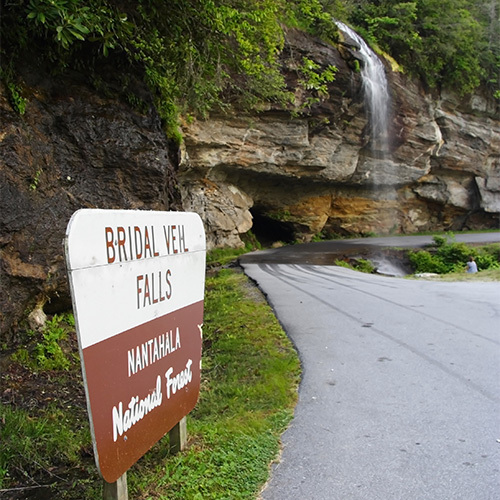 This 60-foot waterfall near Highlands in the Nantahala National Forest is famous as the only waterfall in the state that travelers used to be able to drive behind, as the original route went behind the falls. While it doesn’t have a large volume of water, it is quite beautiful and even visitors in wheelchairs or scooters can enjoy a behind-the scenes look. Sign in to your account to book your Club Lodges at Trillium vacation today!